Wall Street had a lackluster finish on Friday, with stocks sagging under the weight of trade uncertainties as the White House pursued fraught talks on commerce with China. Oil and financial stocks were among the day's biggest losers on the benchmark Dow Jones Industrial Average, which finished flat at 24,715.09, leaving the index down 0.7 percent for the week. The broader S&P 500 fell 0.3 percent to 2,712.97 while the tech-heavy Nasdaq fell 0.4 percent to 7,354.34. This left both indices down about one percent since Monday's open. In a sign investors were seeking refuge from companies exposed to international trade, the Russell 2000, an index of small cap stocks, hit an intraday high and closed up nearly a tenth of a percentage point at 1626.63. 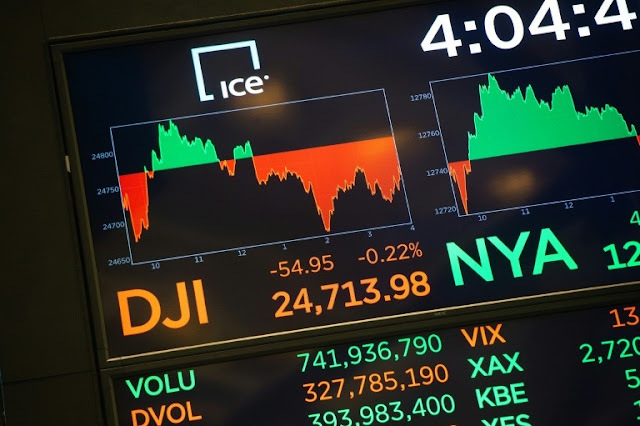 Tom Cahill of Ventura Wealth Management told AFP that with earnings season past and no fresh economic data to spur enthusiasm, equities had no reason to keep forging higher. "Right now the market is looking for a catalyst," he said. "It does not have one." He added that any "positive development" from the Trump administration would also be positive for the market. The White House announced Friday that trade talks with China were going well but there was "no deal yet." The news reaffirmed the administration's commitment to settling differences with Beijing -- likely welcome news after President Donald Trump cast doubt on the talks as they began Thursday -- but came as markets were closing for the week, too late to lift spirits. Financial stocks weighed on the Dow: Wall Street behemoth JPMorgan Chase fell 1.6 percent and investment bank Goldman Sachs dropped 0.9 percent. Citigroup, Bank of America and Wells Fargo were all also sharply lower. Oil stocks were also pressured: Chevron lost 1.2 percent and ExxonMobil sank 0.7 percent. 0 Response to "Wall Street swings to split finish as trade unease persists"